When it comes to blanketing your horse, there are several factors to consider. Regardless if you are going to blanket or not, horses should always have access to adequate shelter, food and drinking water. According to veterinarian Dr. Luke Bass, a horse’s need to be blanketed is dependent on many different factors–how cold is it in your area, what feed are you providing your horse and what is your primary use for your horse? Dr. Bass says “blankets tend to compress a coat’s layers, which compromises their insulating properties. Horses that do not live in extremely cold environments—meaning routinely colder than 10°F—will do well without a blanket, provided they are either stalled during the coldest temperatures or have access to a protective shelter,” and he stresses that providing an appropriate cold weather diet will help keep your horse warm during those cold days. Per Dr. Bass the process of digestion will actually warm your horse from the inside out–pretty neat! Use the appropriate blanket for the appropriate use. A turnout blanket is for use during turnout and is designed to be waterproof. Horses that live in the elements wearing blankets should wear waterproof and breathable blankets. A blanket that is not waterproof will quickly become saturated, making your horse cold—the opposite of the desired effect with blanket use. Still not sure what to do? It seems that blanketing your horse really is a personal decision. 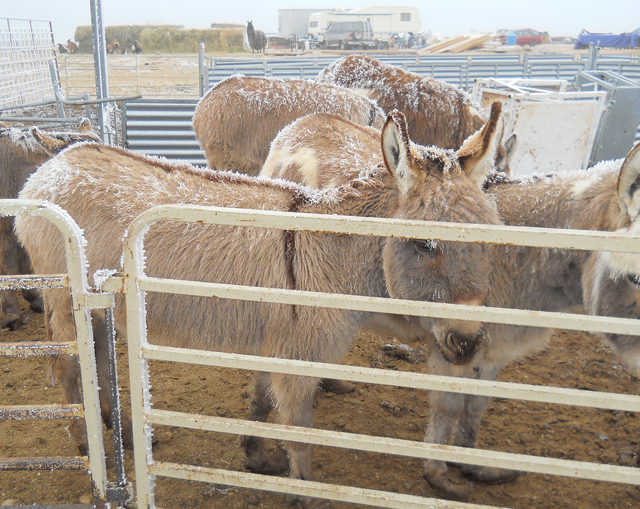 Provided that your horses have access to shelter on chilly days and they are acclimated to a cold climate, they can either be blanketed or not. Our best advice? Contact your veterinarian and see what information they have for providing the appropriate care for your equine buddy. Information from this article was provided by Dr. Luke Bass who is an equine veterinarian at Colorado State University’s James L. Voss Veterinary Teaching Hospital. Read his full To blanket or not to blanket article here.